Scientist’s studying the Arctic’s ancient past have issued a stark warning about the future climatic conditions the Arctic will face after an analysis of fossils and microfossils from Pliocene strata. A team of researchers from the USA, Canada and Holland have published their conclusions in the scientific journal “Geology”. They conclude that the Arctic Circle was much warmer than previously thought 4 million years ago, with average annual temperatures approximately 0 degrees Celsius. 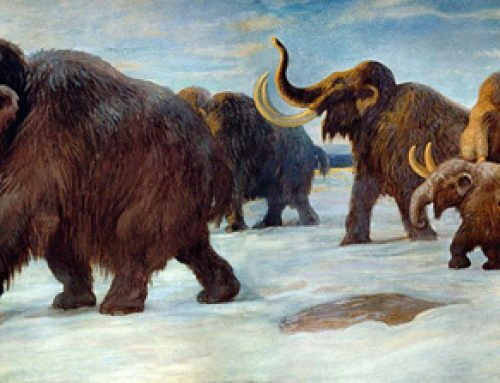 The international team of scientists examined the fossil evidence at a world-renowned Ellesmere Island fossil site and calculated that the palaeo-climate was much milder and warmer than had been previously thought. This evidence provides a stark warming for geologists and climatologists as they calculate the effect of global warming on the Arctic in the 21st Century. Ellesmere island lies deep within the Arctic Circle and it is part of the Nunavut territory of Canada. This heavily glaciated, snowbound island is one of the largest in the world, yet there are only a few hardy scientists as year round inhabitants as the annual temperature for this cold and mountainous region is approximately -19 (minus) degrees Celsius. The island is very important to palaeontologists as there are many fossiliferous Cenozoic sediments plus a number of extremely significant older strata, such as the early Carboniferous sediments that represent ancient stream-beds where fossils of the ancient transitional fish/amphibian Tiktaalik (T. roseae) have been discovered. In this study, the international team analysed the prehistoric evidence from peat deposits dating from the early Pliocene, approximately 4 million years ago. The peat accumulated in a beaver pond (hence the name of the dig site – Beaver Pond), this pond was surrounded by a larch forest, today the only tree native to Ellesmere Island is the Arctic Willow. The plant and animal fossils that have accumulated in these sediments are important to scientists as they provide a window into the past climate of this part of the northern hemisphere as well as helping palaeontologists to understand the interchange of mammalian fauna between Asia and North America during this part of the Earth’s relatively recent history. The team of six researchers published their findings after analysing the fossilised remains of plants, trees and animals that had been preserved in the peat deposits. Based on this information they have calculated that the average annual temperature for this area around 4 million years ago was 0 degrees Celsius, still very cold but not as cold as scientists had thought previously. This clearer picture of the ancient Arctic climate has potentially important and troubling implications for how quickly and severely the region could witness a temperature spike given current climate-change trends. The research was led by University of Colorado scientist Ashley Ballantyne and the paper has been co-authored by Canadian Museum of Nature palaeontologist Natalia Rybczynski and biologist David Greenwood of Manitoba’s Brandon University. Also contributing was palaeontologist Jaelyn Eberle, curator of fossil vertebrates at the University of Colorado Museum of Natural History. When the transitional animal Tiktaalik roamed; Ellesmere Island was situated a lot further south, however, the Beaver Pond site is just four million years old and dates from a time when the island was at roughly the same high northerly latitude that it is at today. In addition, the amount of carbon dioxide in the atmosphere during that time, the Pliocene era, was almost identical to the elevated CO2 levels of today’s warmed-up globe – making the Beaver Pond site an unusually accurate “proxy” for the 21st century Arctic, the researchers conclude. And while the Ellesmere site’s namesake species, a primitive variety of small beaver and other extinct mammals, such Pliocene rabbits and three-toed horses, are indicative of a warmer environment than today, scientists have generally estimated that the average annual temperature at Beaver Pond four million years ago was no higher than -5 (minus) degrees Celsius. However, this new evidence suggests that Arctic temperatures could rise much higher, much faster if present-day climate trends continue. But the scientists predict that the warm conditions revealed by the Beaver Pond site may offer a foretelling of the Canadian Arctic’s climate future. By studying ancient strata, scientists are able to supplement the work of climate models and computer programmes to provide fresh insights into the threat of global warming. Unfortunately, the Beaver Pond site is under threat as a coal mine is planned for the area. Ironically, an important fossil site that may provide clues to our future climate is threatened by the desire to get at fossil fuels that are evidence of the Earth’s climatic past.